Camp in style! 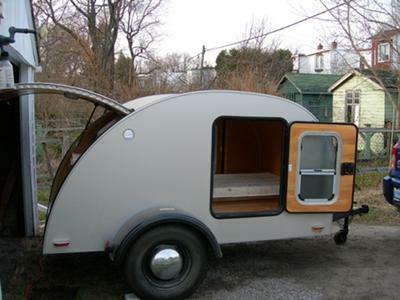 Amish-built 5 foot by 8 foot teardrop trailer (2008), sleeps two, beautiful wood cabinetry, less than 1,000 pounds, stored in garage, like new. From Pleasant Valley Trailers -- details and more pictures of this model are at http://www.pleasantvalleytrailers.com/silver5x8.html .